Prices, Secure Shopping, only U.S.A. Shipping. Click on a below BUY button for all info! Discover a world with no limits aboard this collectible bald eagle art HO scale train collection, the first-ever to feature the dramatic wildlife art of artist Ted Blaylock! Your trip into the wilderness begins with Issue One, Silent Sentinel Diesel Locomotive. Soon more adventure awaits you with Issue Two, Soaring Majesty Engine, which includes a FREE HO gauge track. Then the HO scale train collection continues with Issue Three, Majestic Beauty Dome Car, which includes your FREE power pack and speed controller. 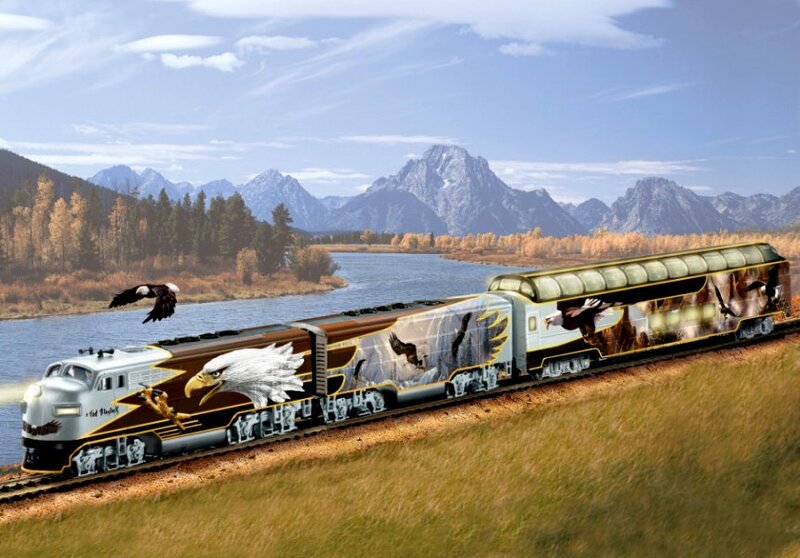 Additional coordinating eagle art train cars, each a separate issue, will follow. Available exclusively from The Bradford Exchange, Hawthorne Village Division, this sleek train collection is adorned with Ted Blaylock's powerful full-color portraits of eagles in flight. Masterfully crafted, it is loaded with authentic details and made all the more dramatic by the lights that glow from within each passenger car and the headlight that beams from the locomotive. A fine addition to your collectible train collection - or an unusual bald eagle gift for a nature lover. So do not wait. Order now! All aboard! Time to start your gothic one-way journey aboard the most ghoulish electric train to enter this world in quite some time, if you dare! Introducing The Journey of Doom Express Train Collection, exclusively from The Bradford Exchange, Hawthorne Village Division. Your terrifying trip starts with Issue One, The Raven Steam Locomotive. Next to give you the frights will be Issue Two, the Journey of Doom Tender and FREE Track, Speed Controller and Power Pack. Soon your ghostly collection will continue with Issue Three, Haunted Hallows Flat Car with Removable Horse-Drawn Hearse, and additional frightfully delightful train cars, each a separate issue to follow. Halloween or year 'round, there's nothing like a wickedly macabre train trip to sooth your inner Goth! Every car in this heirloom-quality electric train features a wealth of devilish details and decoration, all handcrafted and hand-painted. From the glow of blood-red eyes to the dark antiqued finishes, no opportunity to bewitch you has been spared. Even the fully sculpted horse-drawn hearse on the flat car is removable so you may display it as you choose. You're certain to feel a chill down your spine the moment you see the eerie glow of this illuminated gothic train collection as it glides down the track, but demand is expected to be frightening, so don't delay! Order now! Encounter the majesty of the noble wolf with this heirloom quality electric train collection! Your adventure begins with Issue One, featuring the impressive steam locomotive and coal tender. Soon after you can hop aboard Issue Two, a classic train car, which includes the FREE 16-piece HO gauge track. Next, your collection continues with Issue Three, another train car, which includes your FREE power pack. Additional wolf art-inspired train cars, each a separate issue, will follow. Imagine the thrill of watching the old-fashioned steam engine as it glides by, the glow of its headlight emerging from the night! Renowned artist Al Agnew's mysterious wolf art shimmers on each illuminated passenger car - wild wolves stare hauntingly at you, and a proud howl breaks through the deep quiet of a crystal-clear night! Is it the wolves, or the lonesome train whistle? Hurry if you want to find out, because this is the first-ever wolf-themed electric train set by Al Agnew and it's available exclusively from The Bradford Exchange, Hawthorne Village Division! Answer the Call of the Wild - order now! Get ready for a gnarly around-the-clock adventure with legendary heroes in a half-shell! Introducing the Teenage Mutant Ninja Turtles Cuckoo Clock, available in a limited edition ONLY from The Bradford Exchange. Officially licensed and loaded with righteous details, this fully-sculpted Teenage Mutant Ninja Turtles clock lights up and plays the television theme song at the top of each hour. It's a must-have addition to any TMNT fan's home - cowabunga, dude! A grand 2 feet high, this illuminated cuckoo clock features Michaelangelo, Raphael, Leonardo and Donatello poised for battle in their underground apartment. The villainous Shredder appears at the top of the clock case, and sensai Splinter watches over the Turtles from a window above the clock face. On the hour, LED lights illuminate their subterranean lair while the TV set comes on to show April O'Neil reporting. A sculpted half-shell pendulum and "nunchuck" hanging weights add radical finishing touches. Strong demand is expected for this TMNT collectible clock, so don't hesitate - order now! Here's a wonderful way to double your holiday joy this Christmas! Enjoy all the magic of miniature snowglobes brought together with the charm of an old-fashioned train, full of cheerful holiday details. 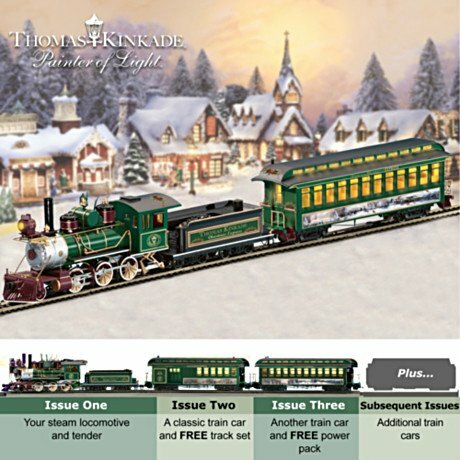 The Thomas Kinkade Wonderland Express Train Collection starts with Issue One, Santa Claus is Comin' to Town and continues with Issue Two, Deck the Halls, Issue Three, Home for the Holidays, Issue Four, Winter Wonderland and is completed with Issue Five, Silent Night Caboose, each issue shipped separately. 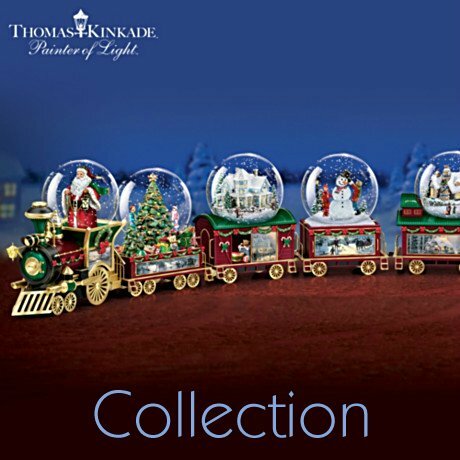 A Bradford Exchange exclusive, this delightful snowglobe train collection is handcrafted and hand-painted by artisans of Rhodes Studios, complete with sculpted wreaths, golden painted trims and favorite Thomas Kinkade art faithfully reproduced on both sides of each train car. Inside the working miniature snowglobes, glittering "snow" swirls around festive sculpted images inspired by Thomas Kinkade art. The musical train engine even plays the happy holiday tune "We Wish You a Merry Christmas"! Demand is expected to be high for this first-of-its kind, limited-edition musical Christmas train collection, so be sure to order now! 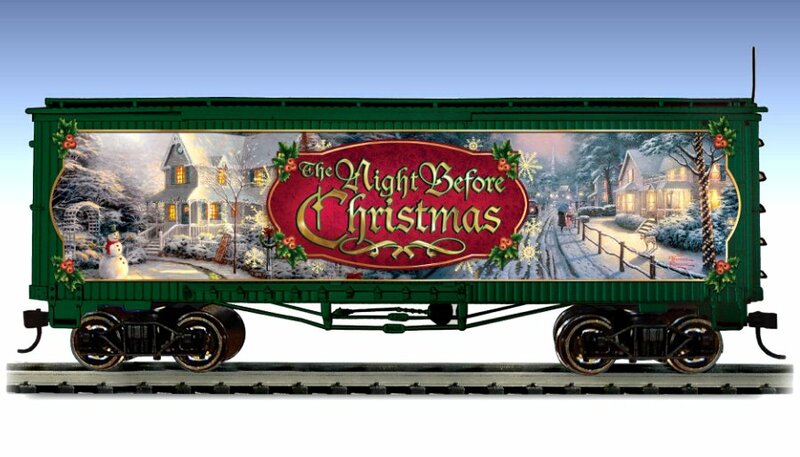 There's no time like the holidays to enjoy the heartwarming artistry of Thomas Kinkade, whose masterful vision inspires this exclusive talking The Night Before Christmas train car. Available only from The Bradford Exchange, Hawthorne Village Division, this festive box car features both the art and the voice of Thomas Kinkade! The meticulously detailed box car - designed to run on any HO-gauge track - is expertly crafted to bring you years of enjoyment. It showcases two of Thomas Kinkade's holiday masterpieces, "The Night Before Christmas" and "Hometown Christmas Memories", in full color and vivid detail. Plus, at the push of a button, you'll hear a classic recording of "The Night Before Christmas" by Thomas Kinkade. Very strong demand is expected for this unique talking Christmas train car, so don't miss out. Order now! Here's a delightful new way to "shake up" your idea of an old-fashioned Christmas train display! This unique collectible brings together the magic of a real Santa snowglobe with the charm of a vintage-look musical Santa train car, full of cheerful holiday details. Better still, beloved holiday art of Thomas Kinkade graces both sides of this amazing train car to give it the look of a timeless holiday treasure.A Bradford Exchange exclusive, this sculpted train engine is handcrafted by the artisans of Rhodes Studios, lavished with hand-painted details like a sculpted wreath and golden painted trims. Adding to the festive look, beloved Thomas Kinkade art is faithfully reproduced on the sides of the car. Inside the working miniature Santa snowglobe, glittering "snow" swirls around St. Nick as he holds up a lantern - Thomas Kinkade's signature symbol - and an overflowing bag of toys. The train engine even plays the happy holiday tune "We Wish You a Merry Christmas"! Demand is expected to be high for this first-of-its kind, limited-edition holiday collectible, so be sure to order now! 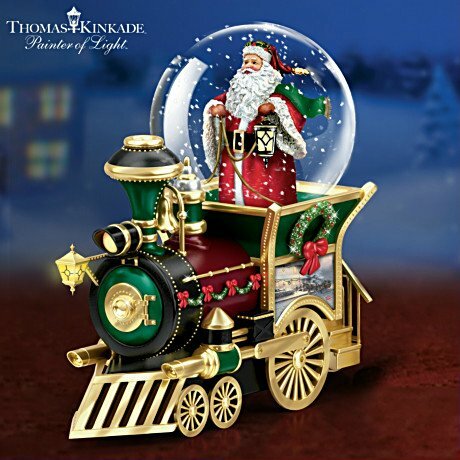 Take a ride back to a simpler time on the only illuminated electric Christmas train collection inspired by Thomas Kinkade, the most collected artist of our time! Your collection begins with Issue One featuring the impressive steam locomotive and coal tender. Soon after you will receive Issue Two, a classic train car, which includes the FREE 16-piece HO gauge track. Then your Thomas Kinkade train collection continues with Issue Three, another train car, which includes your FREE power pack. Additional Thomas Kinkade-inspired train cars, each a separate issue, will follow. Available only from Hawthorne Village, this richly detailed Christmas train collection was specially created to lend vintage charm to your sculptural village collection. Each train car is embellished with a Thomas Kinkade Christmas scene and lavished with authentic details, including a headlight on the 2-6-0 engine and passenger cars that actually light up. Just imagine the Christmas Express, its windows aglow and the locomotive shining the way, spreading Christmas cheer as it rolls through your collectible village - if you hurry! Strong demand is expected, so order now! For over 40 years, members of the Starship Enterpriseâ„¢ have brought us incredible adventures exploring the Final Frontier! Now, celebrate this legendary show with the exclusive collectible STAR TREK electric train collection. The voyage begins with Issue One featuring an impressive diesel locomotive. Soon, you'll receive Issue Two, the coordinating STAR TREK engine, which includes a FREE HO gauge track. 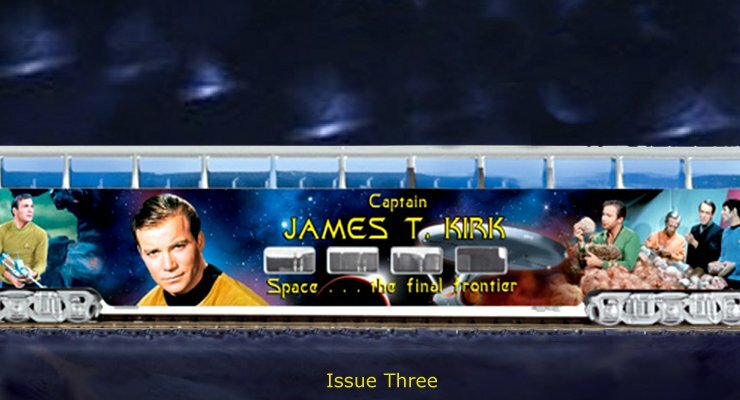 The HO-scale train collection continues with Issue Three, a passenger train car, which includes your FREE power pack, followed by Issue Four, Science Officer Spock - Live Long and Prosper dome car. 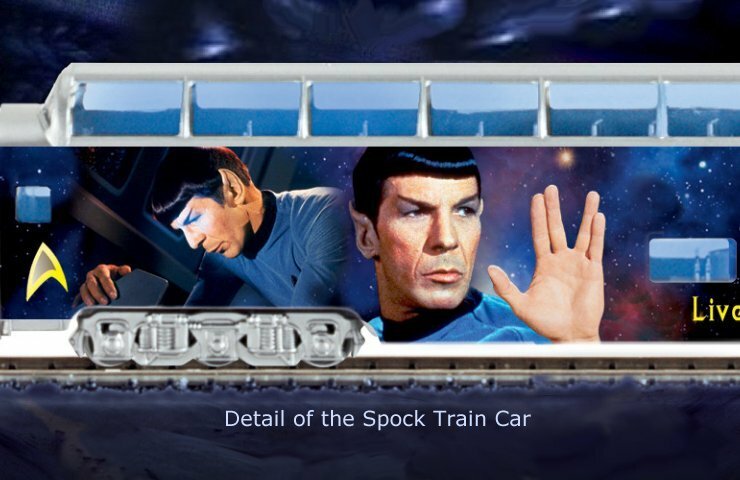 Additional coordinating STAR TREK collectible train cars, each a separate issue, will follow. Inspired by the original STAR TREK series and available exclusively from The Bradford Exchange, Hawthorne Village Division, this collectible STAR TREK HO-scale electric train collection is emblazoned with dramatic scenes and imagery from the original TV series. You'll want to "explore strange new worlds, to seek out new life and new civilizations - to boldly go where no man has gone beforeâ„¢" with this intricately detailed STAR TREK collectible that brings Captain Kirk, Spock, Dr. McCoy, Scotty and others to life. And, your collection includes the First Officer Spock dome car in tribute to one of the most legendary characters in science fiction history, arriving as Issue Four. Every inch of this STAR TREK electric train collection is precision scaled with authentic details - from the solid metal chassis and steel alloy wheels to the passenger train cars that actually light up. This is your chance to report to the transporter room and beam yourself aboard, but don't delay! Heavy demand is expected for this STAR TREK collectible, and it would be highly illogical to miss the chance to take a voyage on the Starship Enterprise. Order now! 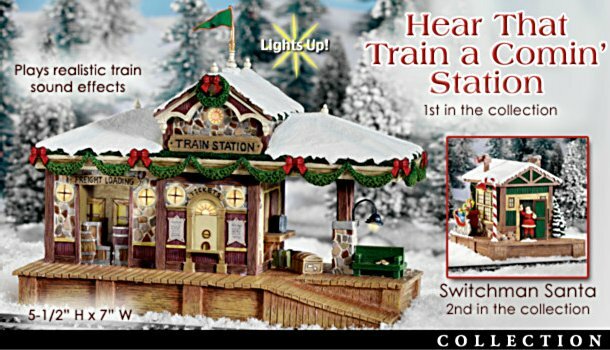 Get your holiday train display on track with these collectible train accessories, exclusively from Hawthorne Village! It's easy to add realism to your train layout with these nostalgic collectibles, beginning with Issue One, Hear that Train a Comin' Station. Soon, your holiday accessories will keep a chuggin' with Issue Two, Switchman Station with Santa. Later, your collection will continue with additional train accessories, some with FREE figurines and each a separate issue to follow. Beginning with a fabulous train station, every detail is handcrafted by master artisans, from authentic looking stone work and rough hewn flooring, to festive Christmas decorations and realistic train sound effects! You'll be delighted with all the special features in future issues too, from a switching station with a Santa who pops out as your train passes by, to an illuminated station platform and even FREE figurines. These are must-have accessories to any prized train collection. And you won't find a finer value anywhere. Hurry and order now! Here's your opportunity to own a very special, limited-edition model train set collection, a train embellished with the genius of Walt Disney! The magic begins with Issue One featuring the impressive steam locomotive and coal tender. Soon you'll be enchanted by Issue Two, a classic train car, which includes the FREE 16-piece HO gauge track. 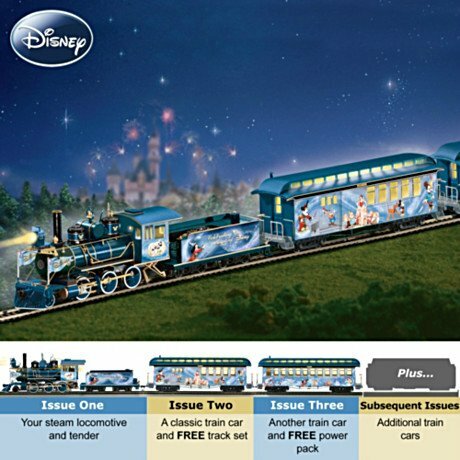 Then your Disney train collection continues with Issue Three, another train car, which includes your FREE power pack. Additional Disney train cars, each a separate issue, will follow. Imagine this old-fashioned steam locomotive chugging merrily along, the engine headlight shining into the night as golden light spills from the passenger cars! You'll be riding the rails with all your favorite Disney characters, including Mickey Mouse, Minnie Mouse, Donald Duck, Snow White, Goofy, Pluto, Tinker Bell and other Disney favorites! What a magical way to bring back all those wonderful Disney memories - but only if you hurry! Strong demand is expected for this train set collection, so order now!Fine collectibles, not intended for children. Add a touch of intrigue to your train set display with this collectible train set accessory! This exciting Rocky Mountain train tunnel is the perfect HO scale accessory, meticulously handcrafted by master artisans and loaded with flawlessly recreated details. 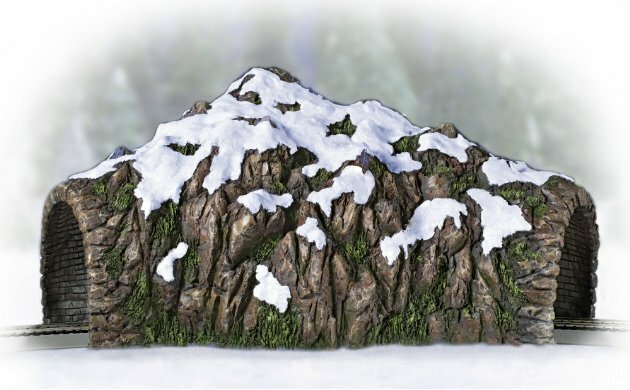 Check out the authentic-looking landscape with its rugged, rocky contours, lifelike greenery, and sparkling, glitter-touched snow.Every magnificent detail of this fine train set accessory adds a special touch of realism, making this a must-have accent for any prized train display. It's available exclusively from Hawthorne Village, and you won't find a finer value anywhere, so don't delay! Order now! NASCAR - Dale Earnhart Jr.